Key players from Mike Foran Public Relations client Chicago Furniture District showcased a series of green, sustainable options for the home in the main rotunda of the Museum of Science and Industry. From a club chair featuring cushioning made with soybean and corn husk products, and a bed constructed of reclaimed barn siding, to kitchen and bath tiles made from curbside glass recycling programs, and benches made from salvaged, 100-year-old rail road ties, earth-friendly solutions took center stage. 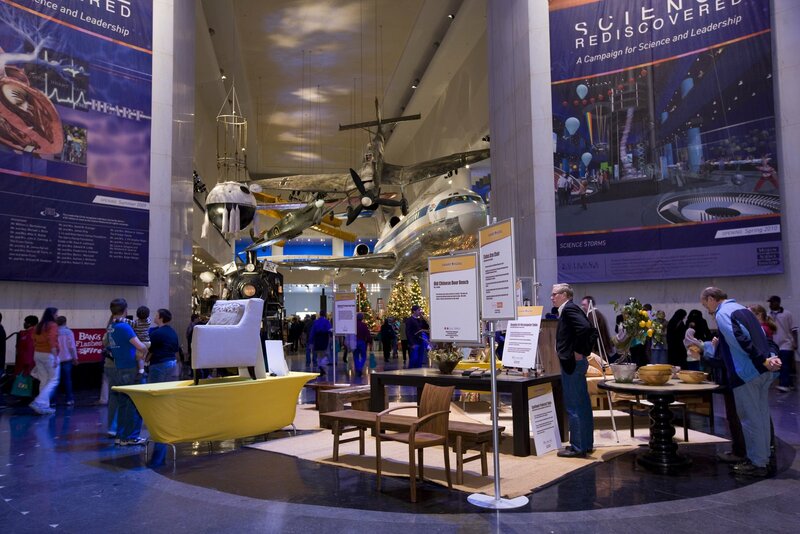 The display was part of the Museum of Science and Industry’s Home for All Seasons fall event, one of four seasonal events supporting the Smart Home: Green + Wired exhibit. The event also included a farmers’ market, appearances by cast members from Broadway in Chicago’s Wicked, trick or treating at the Smart Home, cooking demonstrations using solar-powered ovens, an eco-friendly Halloween costume competition, fall gardening tips, and more. Our client, the Chicago Furniture District, is comprised of dozens of one-of-a-kind home furnishing and accessory shops and galleries all centrally located in Chicago’s River North community.